Nyt tehdään ihan jotain muuta kuin kortteja! Tein muutaman tikkutalon malliksi. Happy Saturday, it's time for a new Allsorts Challenge! Our sweet DT Susan wants to see "anything but a card". I made some decorated matchstick "houses". Samalla myös muistutan maaliskuun Penny Black and more haasteesta. 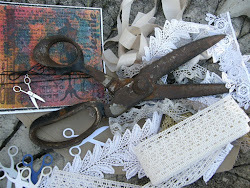 Here's my second DT sample for Penny Black and more "Anything goes with stamp". You have still time to make an entry! Please head over to Allsorts Challenge and Penny Black and more for all the details and prizes of this challenge, and to check out all the fabulous inspiration from my very talented team mates. Your little house are so pretty Mervi as is your Penny Black share, lovely soft feminine colours. Hienoja taloja ! Tykkään itsekin tehdä noita. Wonderful creations Mervi! Love all the pretty papers you used for the matchstick houses, and what an adorable card for Penny Black & More! Those little houses are brilliant, what a great idea. These are beautifully decorated, lovely little personal gifts for instance together with tea light candles. I love girly cards Mervi and yours is gorgeous. All the lovely embellishments compliment your card beautifully. Love the different designs on your matchbook houses - very original. Lovely PB creation, so soft and subtle. 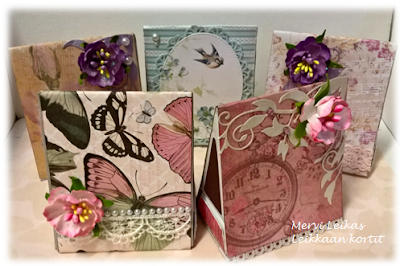 These are really pretty boxes, and a gorgeous Penny Black creation. Beautiful card, love the colours sweet image and your box,s are beautiful, thank you for sharing with us at Cardz4 Galz hope to see you next time good luck with the challenge.